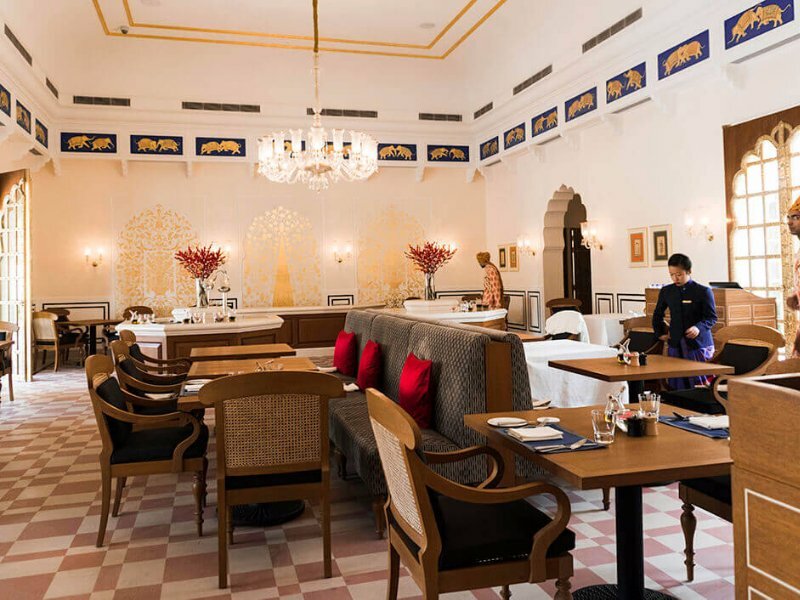 The Oberoi Sukhvilas Resort & Spa, on the outskirts of Chandigarh in the state of Punjab, is the Oberoi’s latest addition to their collection of luxury Indian hotels. Sitting at the foothills of the Himalayas and nestled within the Siswan Forest, this unashamedly opulent resort sprawls across 20 acres of manicured gardens, and is surrounded by a further 8000 acres of lush woodland. 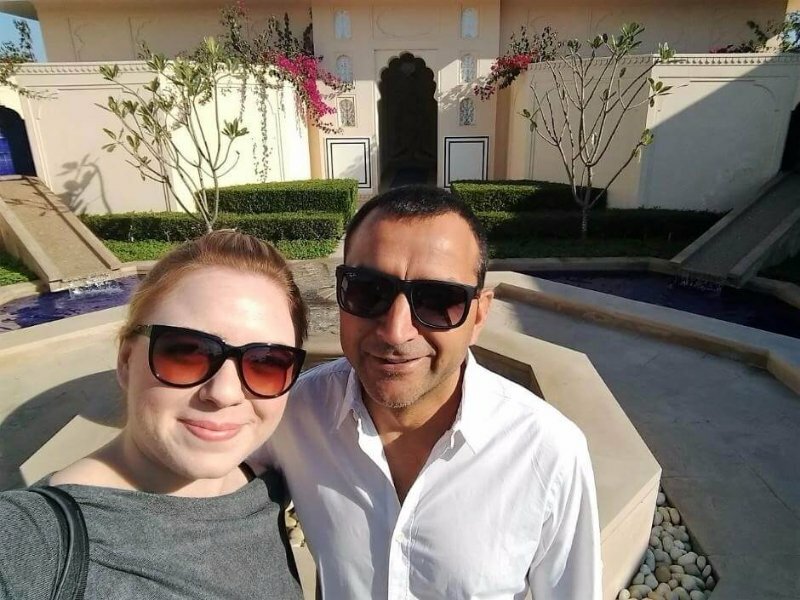 On learning that the Oberoi group were to open their latest ‘vilas’ property (that’s the name it gives its leisure hotels), after a hiatus of 14 years, we were very excited to try it for ourselves. After a long five hour drive from Delhi (alternately, one can fly or take the train), as we entered the gates we were transported into sequence of landscaped courtyards, Mughal-inspired arches and colonnaded verandahs, with golden finials glistening above onion-domed rooftops. 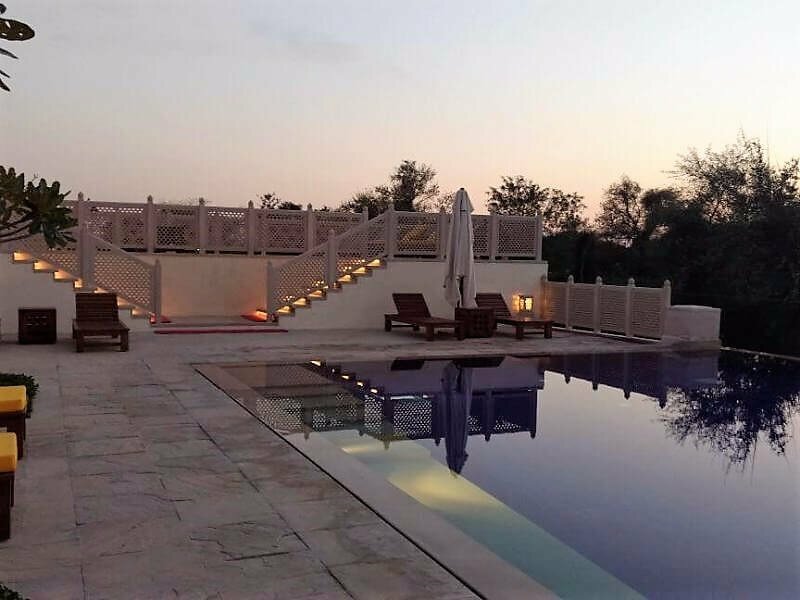 The architecture is familiar of the other Oberoi vilas (such as the Oberoi Rajvilas in Jaipur and the Oberoi Vanyavilas in Ranthambhore) yet has its own distinct personality. An avenue of fountains, streams and reflection pools draws you to a pair of soaring brass-framed doors, which rise majestically from floors of red sandstone. As you step through them into the lobby your eye is drawn to the charming golf-leaf elephants dashing happily across the cornices. Simultaneously, you’re greeted by the scent of a huge bouquet of fresh, pink lillies, as a member of staff offers you a cold towel. 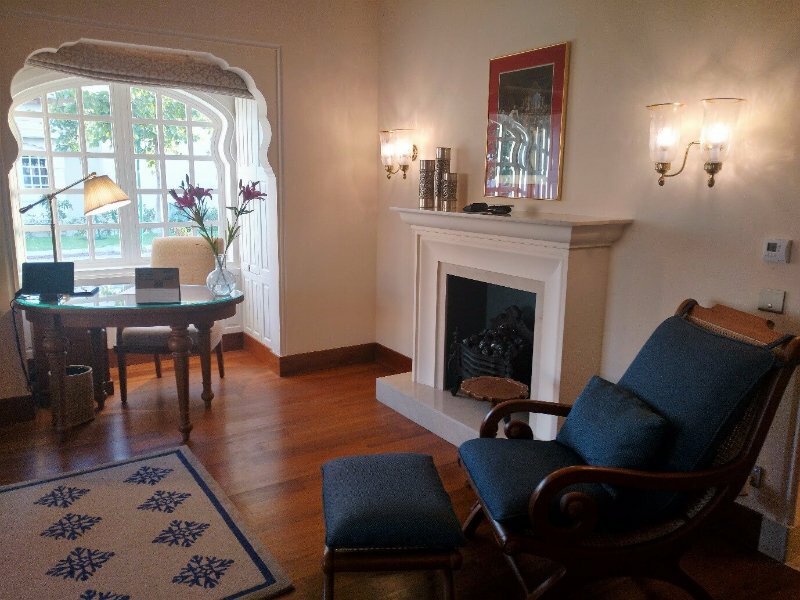 We were whisked through the property to our lodgings for the night – a Premier Room. 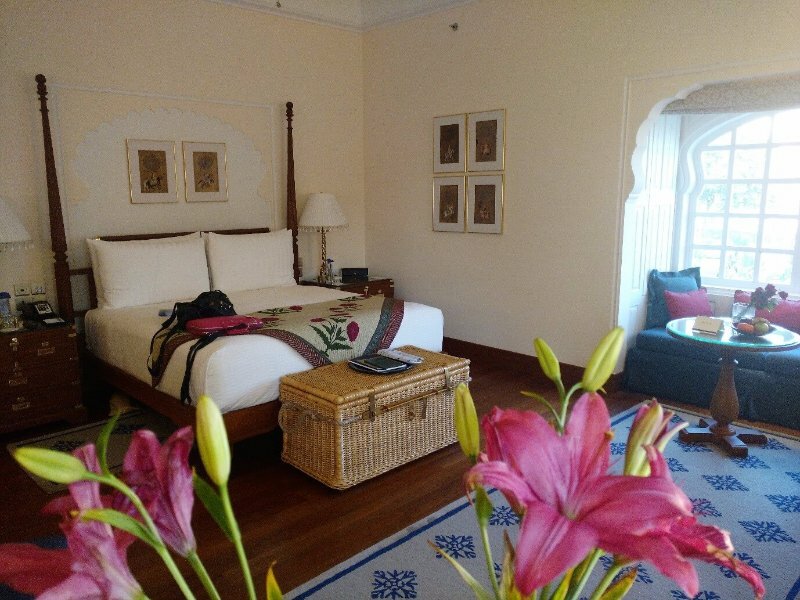 Five different categories of rooms and suites are on offer at the Oberoi Sukhvilas; from the Premier Room, to the Royal Tent, Royal Forest Tent with Private Pool, Luxury Villa with Private Pool, and lastly the palatial Kohinoor villa. Along the way, Ms. Shivangi provided us with a brief orientation tour, pointing out facilities such as the restaurant, boutique and pool. Inspired by the traditional and very symmetrical Mughal architecture, Premier Rooms are arranged in what the Oberoi call “clusters”. Each cluster features a central courtyard and fountain, surrounded by six rooms. 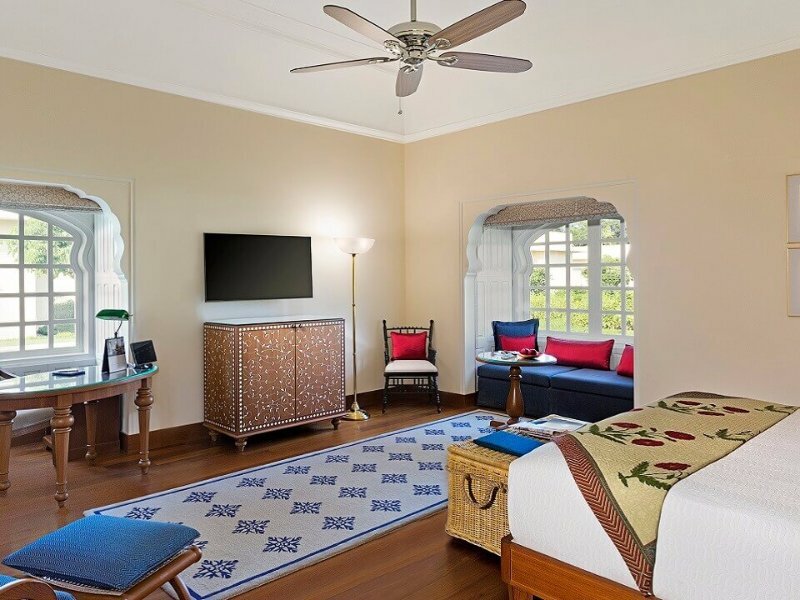 As we entered our Premier Rooms, the décor is delightfully colonial; from the four poster bed, to the teak flooring, to the prints of moustachioed officers. 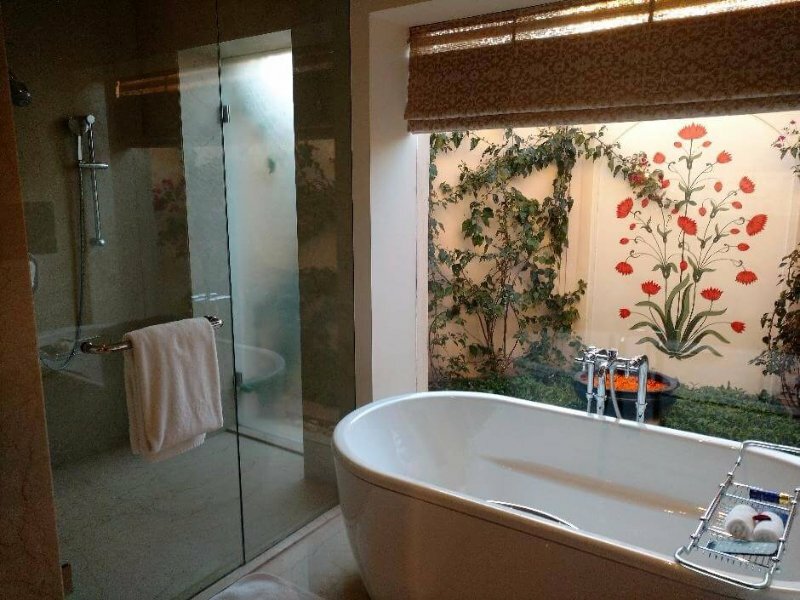 The spacious, 700 square feet room boasts a walk-in closet, a freestanding bathtub (with its own flat-screen television) overlooking a private frescoed courtyard, a separate multi-pressure shower and his-and-her wash basins. 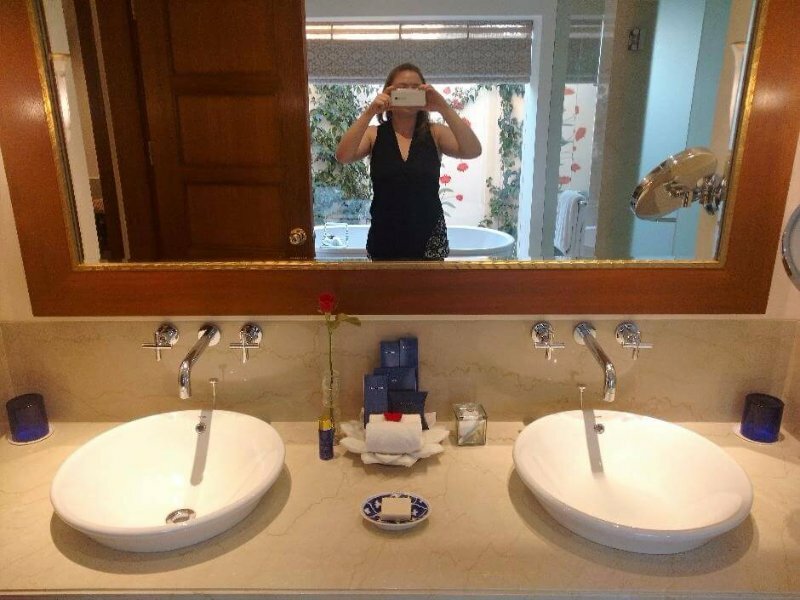 The latest technology blends seamlessly into the room; from the electronic toilet offering a multitude of settings, to the ‘Oberoi Enhance’ iPad allowing you to control the lights, television and room temperature with the touch of a button. 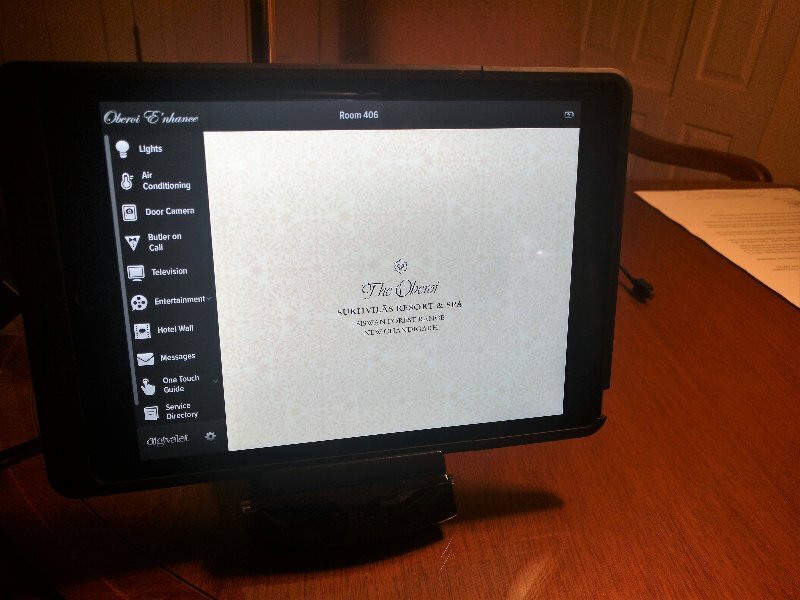 The iPad also connects you to a camera in the doorway, allowing you to see whose outside before you remotely open it. And, you can check your bill, summon the butler, or book a treatment. Having settled into our rooms, we decided to cool off in the pool; a stunning, deep-blue tiled space overlooking the forest. 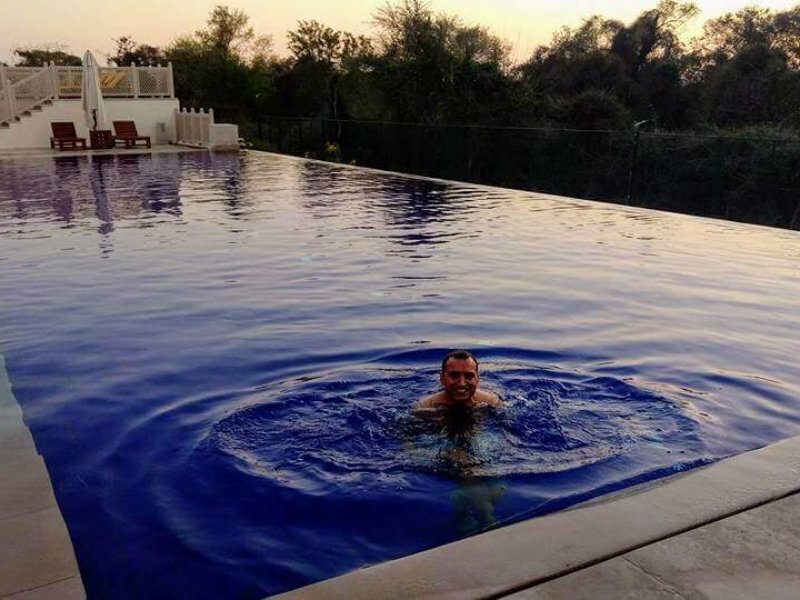 As we swam, we again experienced the signature Oberoi service, as a member of staff discreetly placed towels, chilled water and slippers on our deckchairs. As the sun began to set, lights began to twinkle round the poolside. Later, we headed to the resort’s restaurant – Anant Mahal – for dinner. We were seated at a cosy table on the terrace, and with a chill in the air our table was warmed by a crackling fire-pit. The food and service was excellent as one would expect from an Oberoi hotel. We started by sharing an appetiser of Amritsari fish (white fish fried in a style local to the Punjabi city of Amritsar). For our main course, Madeline opted for a smoked salmon risotto, whilst Shiv enjoyed Kadhai Pakoda (friend dumplings in a spiced yogurt gravy) with Indian breads and pickles. Whilst we didn’t order a desert, we were presented with a surprise chocolate cake, which made for a special ending to our dinner. Walking back to our rooms later that evening, we enjoyed the peace and tranquillity; this would be an ideal place to relax and recharge after the hustle and bustle of Delhi, Agra and Jaipur. Looking up, the sky was full of stars – we were informed that the resort will soon be offering star-gazing activities. The following morning our day began with breakfast in the restaurant. Shiv opted for a traditional Puri Bhaji (fried flatbread with a potato curry), whilst Madeleine attempted to counteract last night’s indulgences with the healthy option; scrambled egg whites. The restaurant offers a variety of Indian, Continental and Asian dishes, so there’s something to suit all tastes – if not, the chef is always keen to discuss your requirements and create something special for you. After breakfast, we headed out with the resident naturalist on the ‘Wild Acacia Trail’ – a gentle walk providing an introduction to the natural habitat of the Siswan Forest. Along the way, the naturalist pointed out interesting flora and fauna, nilghai, and spectacular views. 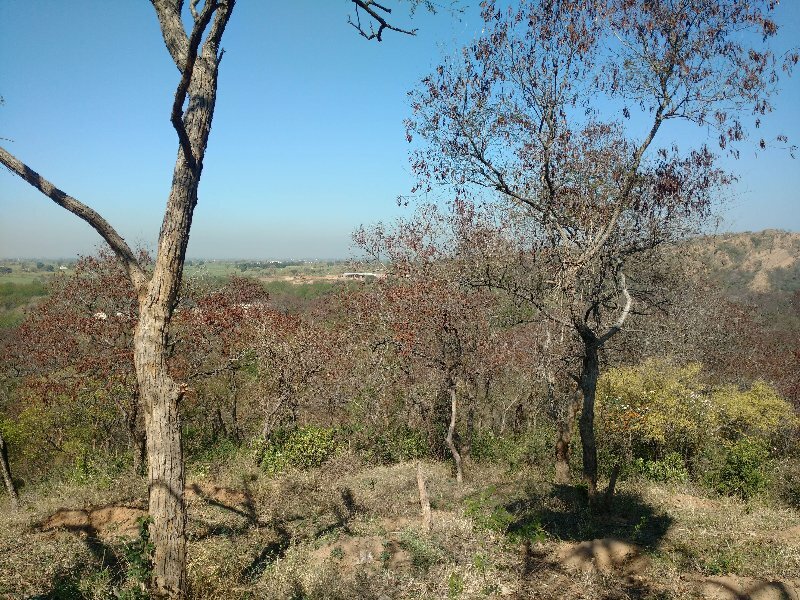 For the more adventurous guests, the Oberoi Sukhvilas offer the ‘Ridgeline Trail’ – a challenging two and a half hour walk through the breadth of the Siswan Reservoir. Alternately, the Oberoi also offer archery, e-cycling, mountain biking, badminton and city tours. 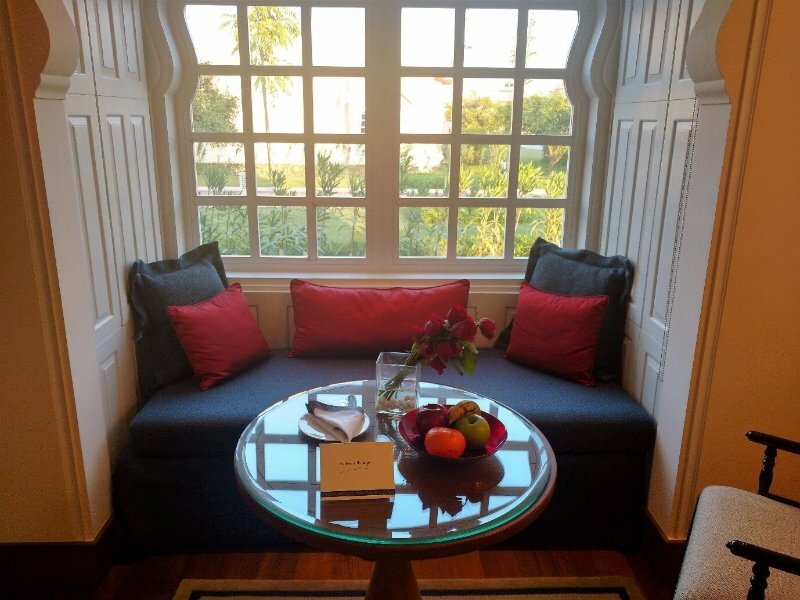 Prior to leaving, we were taken on a tour of the property by Mr. Magdum, in order to explore the various rooms, suites and facilities on offer. At Indian Excursions, we personally visit all the properties and experiences we provide in order to ensure your tour is nothing short of spectacular. Our first stop on the tour was the spa. The spa is not yet quite ready and will be fully functional in mid-April 2017. It is to be the true highlight of the Oberoi Sukhvilas Resort and Spa. Mr. Magdum explains that Sukh is a Sanskirt word that means ‘good space’ and upavasa: ‘to be near oneself’. With good space within and without, one naturally experiences wellness and happiness, and upavasa becomes the most beautiful space to be in. 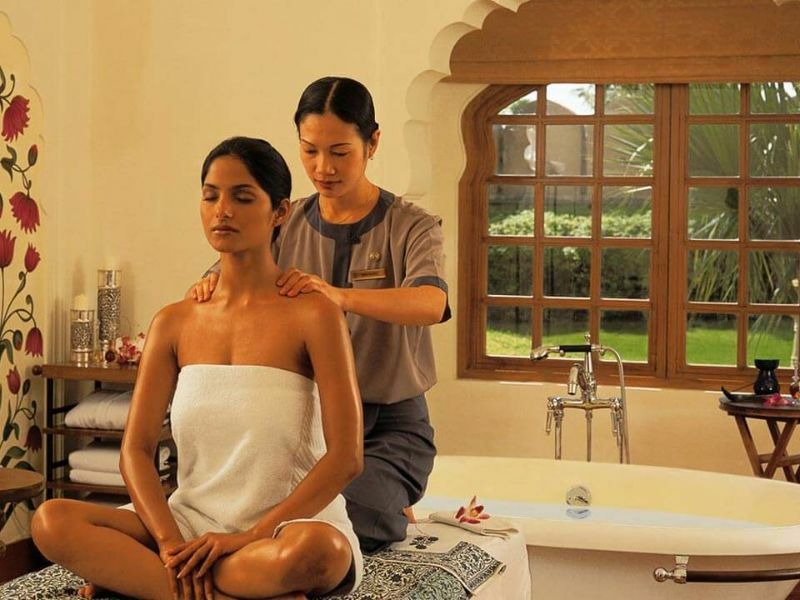 By spending time in upavasa at the Oberoi Sukhvilas Resort & Spa, guests can attain an abundance of sukh that will remain with them long after they’ve checked out. Wellness, Ayurvedic and relaxation programmes, from 1 – 21 days, have been specially curated to help each individual discover their inner sukh. We then proceeded to visit the Royal Tents, which are inspired by the traditional caravans that crossed the desert during the times of the Raj. 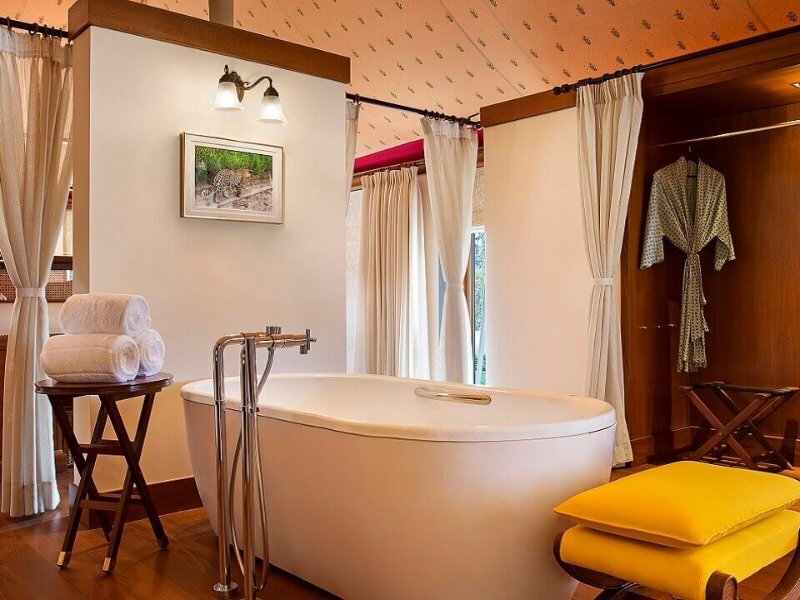 These lavish tents offer all the comforts and facilities one would expect from a 5 star resort; including teak wood floors, a spacious bathroom and four poster bed. We did notice that the décor of the tents is somewhat similar to those found at the Oberoi Vanyavilas in Ranthambhore, so if you’re staying at both hotels during your tour we’d recommend going for the Premier Room (or Luxury Villa) for a more varied experienced. If Ranthambhore doesn’t feature in your itinerary, the Royal Tents here at the Oberoi Sukhvilas offer a wonderfully exciting safari-style experience. 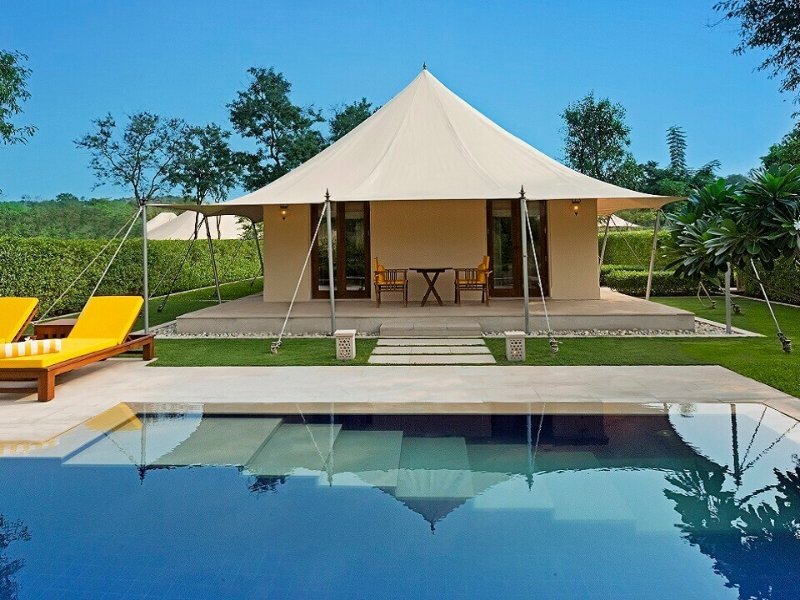 Best of all, a number of the Royal Tents come with their own private, temperature-controlled pool. The spacious Luxury Villa (1500 square feet) boasts a separate living and dining room, in addition to a king size bedroom and spacious bathroom. The private garden and (temperature-controlled) pool are accessed through French doors in the living room. The jewel in the Oberoi’s crown, the Kohinoor villa is truly palatial and spread over 4200 square feet. 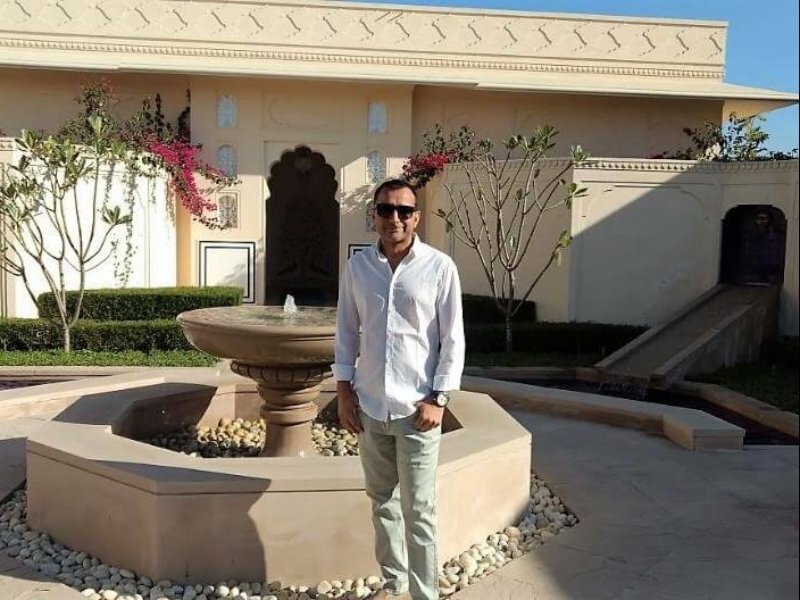 Its design is reminiscent of a traditional Indian haveli (mansion), with a sun-lit courtyard connecting the three bedrooms, private pool and garden, and living/dining space. Rooms at the Oberoi Sukhvilas Resort & Spa start from approximately ₹35,000 ($524 / £427) per night. The property is open year-round, though best visited from October – April. Chandigarh is within driving distance of Delhi (it takes about five hours), else one can fly (an hour) or take the train (four hours). It makes an ideal stepping stone to the Himalayas and a stay at the Oberoi Wildflower Hall in Shimla (do take a look at our sample itinerary by clicking here), else its also a smooth gateway over to Golden Temple in Amritsar (learn more about Amritsar, here). If you’re considering a stay at the Oberoi Sukhvilas on your upcoming trip to India, please do get in touch. As specialists in private, luxury tours of the region and as a preferred partner of the Oberoi Group, we have all the right knowledge, experience and contacts to ensure your journey is nothing short of spectacular.